* Our organizer bag can literally holds everything in place and organize your beauty needs nicely all times. So it would be easy for you to use on the road, bathroom or closet. * What's more important, Size? Weight? Compact-ability? Why settle when you can get all. 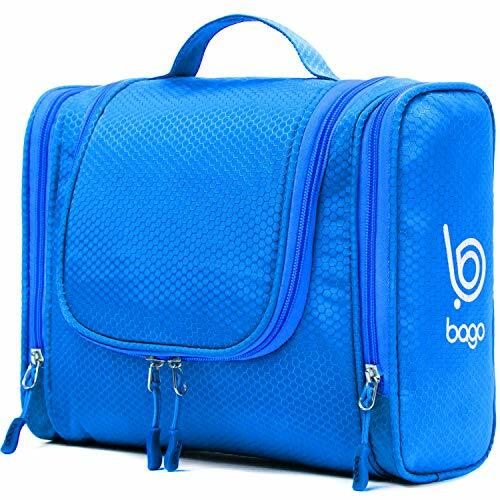 Bago organizing bag is a large size organizer and while made of top material which keeps it highly durable as well as lightweight and quickly drys out if get wet inside. More than that, when it is empty, you can fold it so you can easily store it. * These bags are easily stored inside any luggage and keeps the items in it protected and organized. These bags are also compatible with Bago Travel Bag's other products. * Planing for a weekend getaway or a longer vacation? This fit all lengths and types of vacation. This loyal carrier bag for toiletry kit or other accessories will be suitable for the Gym, Car, Boat or any place you need to keep them tightly stored and ready for use in an instant. * Perfect not only for women or men but also GREAT for children as it is compact, practical, zippers are with high quality and easy to use, and can carry small baby wipes and baby's bottles for the parents among you. When ordering from - 'Bago Travel Bags' You are covered with our - 100% SATISFACTION GUARANTEE! And with our WORLD CLASS CUSTOMER SERVICE! So if you are in a search for a travel organizer / makeup bag / toiletry bag, Do not waist any more time, you have found it. KEEP YOUR PERSONAL BELONGINGS ORGANIZED: If traveling a lot, you know that with cosmetics, makeup, a shaving kit, shampoo, combs, personal hygiene items and small to medium-sized accessories, it get's pretty chaotic! Why not be 100% organized next time you travel with a hanging toiletry bag by Bago? ALL THE SPACE YOU NEED AND MORE: When it comes to travel essentials bags and organizers, size matters! This toiletry bag is spacious, compact and large enough to fit your travel accessories and essentials from make-up and razors to shaving foam, toothbrush/paste, soaps, shampoos, jewelry and more! DESTINED TO ACCOMPANY YOU FOR A LONG TIME: The Bago traveling organizer is made with durable and lightweight Rip-Stop Honeycomb waterproof fabric that protects your items inside. Each bag is durably stitched and equipped with heavy-duty zippers so it becomes a valued and essential companion! DESIGNED TO GIVE YOU OPTIONS: Our travel toiletry bag can be used to store art supplies, as a lunch bag, baby bag or for electronic gadgets. Multiple pockets and compartments offer an array of options for bag uses. Comes in 7 different colors so you can choose according to your own personal style! THE BEST GO-TO TRAVEL ESSENTIALS BAG OR YOUR MONEY BACK:The Bago travel bag makes traveling comfortable and convenient by organizing necessities, cosmetics and accessories. Don't dig or dump everything out to find things. If not 110% thrilled with our toiletry bag, reach out and we'll refund you!